Welcome to the website of Mr. Arunachalam Iyer, Consultant ENT specialist. Mr Iyer did his Higher Surgical Training in the Newcastle rotation where he obtained a certificate of completion of specialty training in ear, nose and throat surgery in 2005. He has done an Otology/Neurotology fellowship at Auckland City Hospital and Starship Children's Hospital, in New Zealand. He has gained wide experience in the management of adult and children's ear disease, in addition to the management of general ENT conditions. 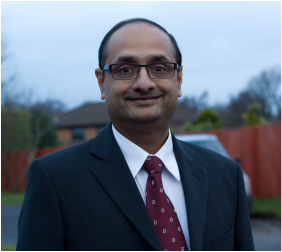 Mr Iyer is Scotland's pioneering surgeon of minimally invasive endoscopic ear surgery and is a member of the international working group for this procedure. He organises various courses, including the Temporal bone dissection course at The University of Glasgow and the first ever Endoscopic Ear Surgery course in association with the Royal College of Physicians and Surgeons of Glasgow. He is a faculty of the ENT update course at Aberdeen, acute airway management course at Lanarkshire and is involved in training junior doctors. He is also an examiner for the MBChB (Glasgow University) and MRCS (ENT) examination conducted by the Royal college of Surgeons. Also, he is actively involved in the recruitment and training of ENT registrars and is a member of West of Scotland training committee. Currently, he is working as a consultant ENT surgeon with a special interest in Otology for NHS Lanarkshire, based in Monklands Hospital in Airdrie. Recently, he has been an international faculty in ENT meetings overseas.